On the mountain of mountains …..
"On the slopes of the range of mountains crowned by the pinnacle we call Adam's peak there lies a tract of country which for the best of reasons is described on the Island's maps as the peak wilderness. It affords impressions of primeval forests, dizzy precipices, rushing, brawling waters and rugged grandeur. If you would court acquaintance with such thrills, you must wander afoot". This is how R.L. 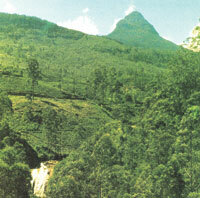 Brohier, introduces us to his writings on Sri Pade or Adam’s Peak. No doubt he like many others before him was mesmerized with its rugged grandeur the majestic cone wrapped in clouds of mist or standing silent silhouetted in the distant sky – "an emblem of hope and cheer to desponding souls". There are many pilgrims treks winding its way to the holy peak. Apart from the traditional old pilgrims path from Kandy through Gampola and Ginigathhena known to the ancients as the Kadiligama High-Way there are four recognized pathways one from the central province slopes and three from the Sabaragamuwa side. If you decide to take the Ratnapura approach or the Gilimalai-para as popularly known, here are some interesting stories to remember which no doubt will enhance your pilgrim experience. Brohier says it is only too true that every rock, every stream and cliff along these pilgrim paths throb with some story of the past. Yawning caves beneath large boulders have some secret to reveal. If one were to probe deeply, it would perhaps tell of the acts of some pious devotee who sought the sanctuary of these forests and searched for merit by eschewing the lusts of the outer world. The origin of many a place name presents a fascinating age old tale if untold the journey will ever remain a disappointment. Brohier begins the chain of stories at the village called Gilimalai. Literally translated, it means mountain swallowed up. He says that it is not unreasonable to assume that the place takes its name from the fact that the peak of the mountain is at this point hidden from view. The next halting place, Palabaddala, is enshrouded with a mystery story. Brohier relates that long long ago, a pilgrim who was very, very poor took a parcel of cooked leaves (minced and flavored) to satisfy his hunger on his way up to Sri Pada. Having arrived at this place he prepared to partake of his frugal meal when he found on opening his parcel that the leaves had by a miracle been turned into rice. Hence the name Pala-bat-dola meaning the mountain stream where the herbs turned into rice. Nili-hela, the next stop on the route, is perched on a narrow ledge of rock which curves round a deep gorge. It is the place of a heart rending locale legend. It goes that once a young mother - Nili, lived here. Her small hut was a welcome refuge for travel worn pilgrims. One day, having placed some clothes to dry on a hedge which grew on the brink of the precipice, she sent her little son to fetch them. In his effort to reach them the child climbed the trees. His mother watched him from the door of the hut. Slowly, the trees leaned over with the added weight and precariously bowed towards the edge of the cliff. The mother suddenly realizing the danger rushed forward to clasp the child to her heart, but it was too late, the tree went over with a crash. Locked in each others arms they were hurled through space, down, down into the giddy depths below, where the waving tops of great big forest trees hid them forever from view. April 7, 2007tory is remembered Leaning over the cliff, they shout Nili Akka ! And Brohier says that from the seemingly bottomless depths there comes back a reply. The lofty crags take up the cry, it is thrown hither and thither –"Nilli Akka…'liakka… akka! merging eventually in a hum of distant fleeting sound. She will ever answer, says the traditionalist. Undoubtedly the place has a wonderfully eerie echo. Next Diyabetma stands on a ledge, which as its name implies is a watershed. The intervening space of nearly three miles between it and the summit is so steep that the pilgrims have conferred on this section the appropriate name of akasagawwa, which means literally the sky league. Here once was erected a building for the wife of Sir Robert Brownrigg –– when she climbed the peak. On leaving Diyabetma the path drops down the steep face of a ravine and we come to an enormous mass of rounded rocks washed by perpetual streams. Brohier observes that the pilgrim who ascends from the Ratnapura approach claims this as the true Indi katupana. Where legend asserts that the Lord Buddha when on earth sat on this rock mending his robe. Mara the wicked tempter noticing this caused a flood to rush down the mountain. To his wonderment when the waters reached the rock they parted and ran on either side of the rock. To mark this incident the pilgrims make an offering of needle and thread at this spot. The ascent recommences by passages so steep as to be accessible only by means of steps hewn in the smooth stone. These are said to have been cut by a king who himself made – a pilgrimage to worship at the shrine. It thus came to be called Dharmarajagala. A legend suggests that these steps may never be counted correctly. It is left to somebody sufficiently composed at this stage of the ascent to disprove the legend. The steps number over a hundred. Heramiti-pana Brohier says takes its name from the fact that the climber usually secures a heramitiya or staff to help him up the rest of the ascend. Andiyamalatenna, as the name would imply is a shrine and the grave of a Muslim dignitary. Having reached this spot one stands on the shoulder of the cone. Nearby is Menik lena or the cave of gems. Progress beyond it, up the pillar like crag which rounds away on every side, is not without peril. There are several series of chains and iron railings securely riveted on the rock to hold the climber up. One looks down from this giddy footing into a chasm of unseen depth and is incited to hail with delight the terrace which forms the apex of the peak. Between Gilimalai and the summit, the ascent upwards of 7,000 feet is made in less than nine miles. The sacred mountain of the Holy foot print or Sri Pada or Adams Peak rises 7,360 feet amongst the central hills of Sri Lanka. During the pilgrimage season which begins in December and ends in April millions of pilgrims trek their way up the holy mountain. Famous travelers from around the world through out time have walked the sacred miles. John Still observes that it “must be one of the vastest and most widely reverenced cathedrals of the human race”. In his book the Jungle Tide he writes ; “In the middle of the hills of Ceylon now sacred to tea, there towers a mountain so famous that the literature of 2000 years in several languages would have to be searched if all references to it were to be assembled in one book….".. The sun rise from the mountain has been acclaimed as a visual delight of unsurpasing beauty. Pilgrims wait patiently enduring bitter cold nights, chilly mists and innumerable other difficulties to glimpse and capture its phenomenon.